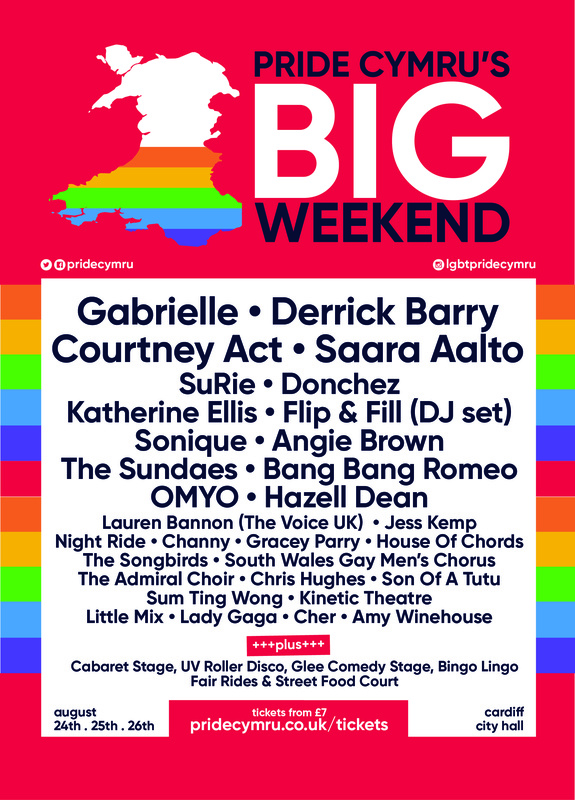 Pride Cymru’s Big Weekend 2018 will take place this weekend (24 -26 August 2018). The Big Weekend is a celebration of inclusivity and diversity, held annually by Pride Cymru. 40,000 people are expected to attend the event on Cardiff City Lawns over the weekend. Derrick Barry, Courtney Act, Saara Aalto and Gabrielle are amongst this year’s acts who will be performing. Saara Aalto is a Finnish singer who rose to fame when came second in The Voice Finland in 2012. She then went on to represent Finland in the Eurovision Song Contest in 2011 and in 2016, coming second both times. There will also be entertainment from Glee Comedy Club, a Cabaret Stage, a UV Roller Disco, a Bingo Lingo takeover and beach party. As well as this, there will be food and drink, market stalls and a family area at the event, which will run on August Bank Holiday weekend. The theme for this year’s Big Weekend is #ProudToBeMe. The campaign aims to encourage members of the LGBT+ community and beyond to use their voice and be proud of their identity.